A veteran boatbuilder with a passion for speed demonstrates a slower, more gentle side with this 85-foot little ship. You might not have heard of Fausto Filippetti, but you know his work. With Tilli Antonelli and Giuliano Onori, he was one of the triumvirate who founded Pershing Yachts back in 1985, building the company into a global brand. 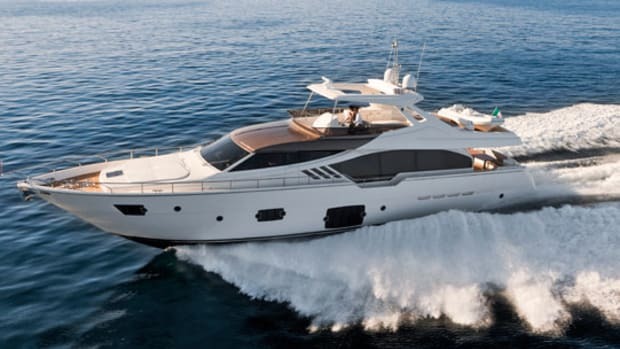 When Pershing was duly snapped up by the Ferretti Group during that Italian giant’s fevered late 1990s shopping spree, Filippetti invested his windfall and set up as a Pershing distributor for France and Italy. But he didn’t leave boatbuilding behind. 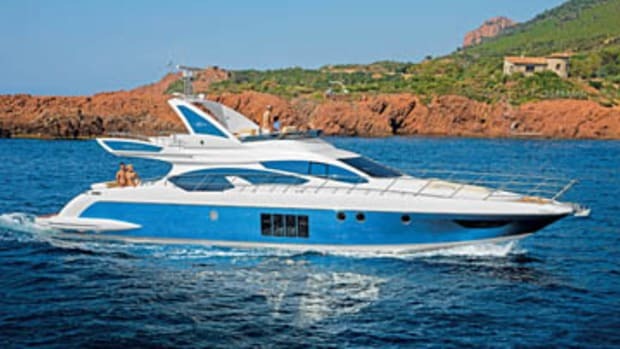 As his sales company grew, he launched the Evo shipyard in 2004 and Daemon in 2008, building powerful, high-end, and very Italian motoryachts designed by Fulvio di Simone and Luis de Basto. “My passion is fast boats,” says Filippetti. His own boat is a 3,600-hp Daemon 75, capable of 45 knots. But while he admits to getting his kicks by burning industrial quantities of diesel, he is aware that this places him in a dwindling minority. Times are changing. “The market now wants navetta-style yachts,” he observes—and there are plenty of yards, particularly in Italy, which seem to agree with him. 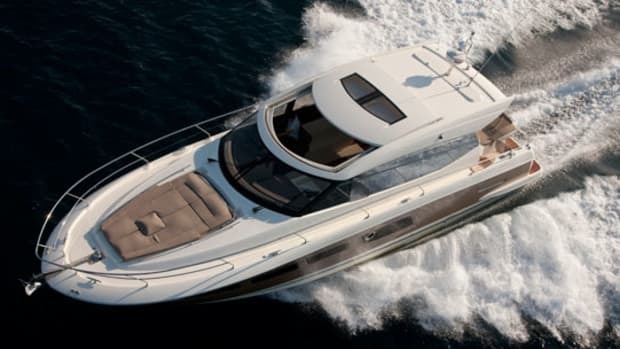 Increasingly, yacht owners wish to trade speed for range, and sleek styling for comfort. And comfort is a priority onboard his latest project. Designed by Pietro Mingarelli, the Filippetti Navetta 26 has a tall superstructure and a voluminous hull that belies her relatively modest length. 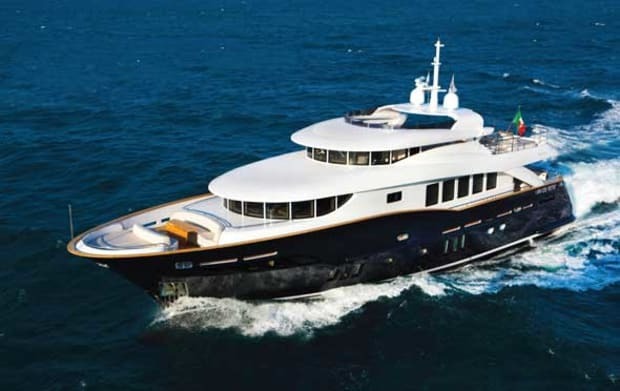 With styling that clearly draws its inspiration from the world of megayachts, this is a vessel of less than 72 feet on the waterline that nevertheless has terrific harbor presence. Moored stern-to the dock at last year’s Cannes boat show, she looked perfectly at home among the 100-footers thanks to her substantial beam and height. 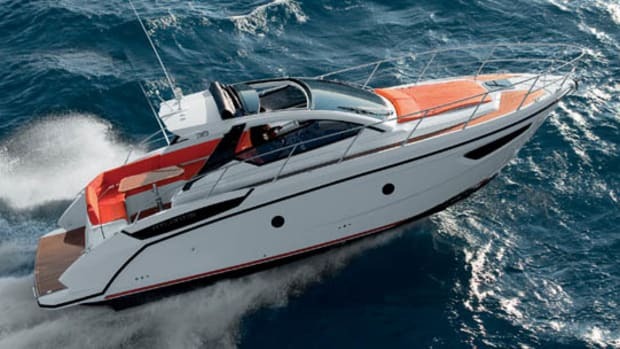 Indeed, the 26 is the sort of yacht that gets you measuring the headroom just to see if it’s really as generous as it seems. And it is—nowhere in the accommodations is it lower than 6 feet 8 inches, and in part of the VIP suite it reaches 7 feet 3 inches. The beds are full size. You can turn around in all the head compartments, and with its marble seat the owner’s shower could accommodate a couple of sumo wrestlers. The side decks are wide and exceptionally secure, with the midships guardrails 3 feet 8 inches off the deck. The crew’s quarters in the stern are civilized and comfortable, and the transom garage has space for a Sea-Doo as well as a 12-foot 6-inch Williams tender. The foredeck offers both a sofa and a sunbed, which hinges up cleverly to reveal windlasses beneath. Even engine access is unusually good. Throughout, in fact, there is true generosity of proportion—this is a big yacht, but it’s still only 85 feet long overall. Certain elements of the layout underpin this big-boat feel. 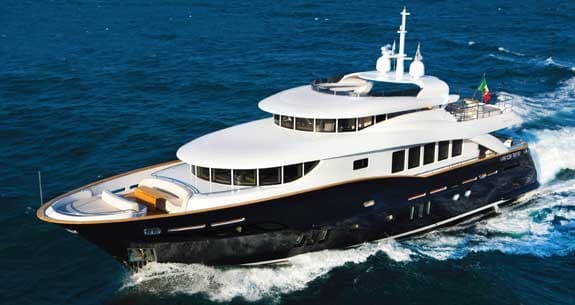 The galley is enclosed, positioned amidships—just where it would be on a superyacht—and although not large, it is well laid out. The split-level owner’s suite is also on the main deck, with light and views thanks to a semicircular sweep of windows, and a superb shower and head area down forward, where there is also a dressing table, a big walk-in locker, and cleverly positioned mirrors to accentuate the sense of space. The lower deck is reached via a curving portside companionway just past the dayhead. There is a twin-berth suite on the starboard side and a double to port, both with seriously roomy heads. The VIP is in the bow and the sleeping area rivals that of the master suite for size, with its sofa, dressing table, and walk-in wardrobe. The fact that this full-size and totally uncompromised suite is sited directly beneath the master gives an indication of the volume and depth available in the Navetta’s hull. This first 26 was fitted out in a bespoke scheme for its Italian owner with wenge floors, contrasting white-oak joinery, white onyx in the heads, some attractive art deco detailing and, naturally, white or very pale carpets and upholstery. The crew is going to be busy keeping everything pristine. 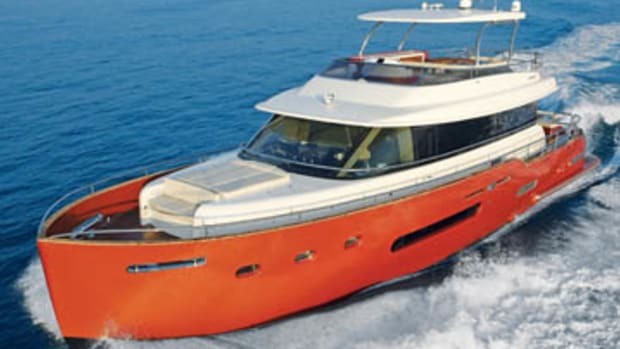 Filippetti Yacht offers a range of décor options, and the list of standard equipment is impressive too, including as it does pretty much everything from fin stabilizers and teak decking to TVs and stereo equipment. There are no alternative layouts, although the vast forward lazarette—which in standard form is extra galley stowage, complete with additional fridge and freezer capacity—can be fitted out as a sauna. It is always a relief to escape the heat and bustle of the Cannes show by taking a boat out, and with its engines virtually inaudible the Navetta proved unusually relaxing as we ghosted past the lighthouse. The wheelhouse—which although quite compact has all the big-yacht features you could wish for, from a pilot berth to a chart table—provides excellent sightlines. 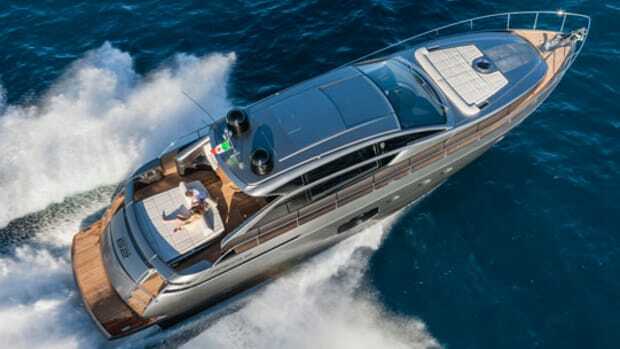 With 1,410-horsepower as standard and a semiplaning hull shape, the 26 can easily exceed its theoretical displacement speed of around 11.4 knots, although at an inevitable cost in fuel efficiency. This first Navetta was fitted with nonstandard 873-horsepower Cat C18s which lent an unexpected urgency to the acceleration, and we topped out at 15.4 knots. 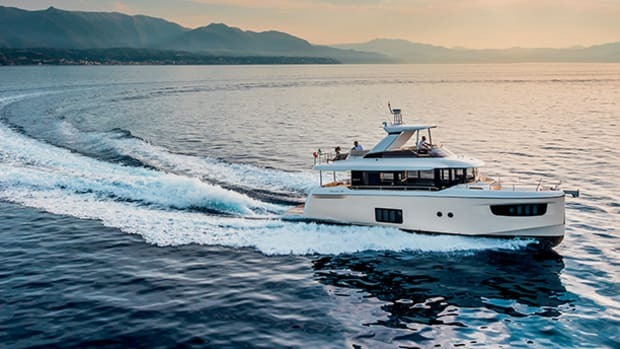 Optimum cruise would be around 12 knots, however, which with the Navetta’s immense fuel capacity provides a safe range of more than 1,700 miles. 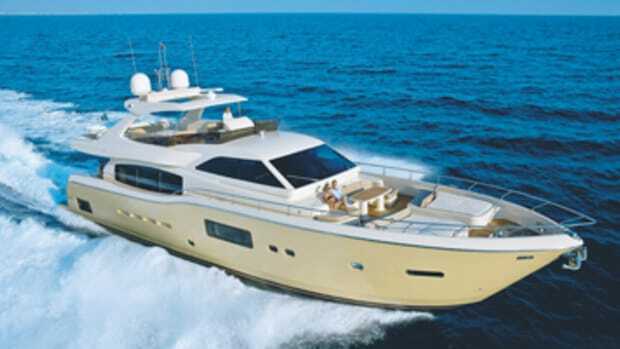 The yacht’s handling was surprisingly positive, with a very tight turning circle at speed, and a slight outward heel. Conditions were disappointingly balmy and provided no test of the hull’s seagoing capabilities, although charging through our own wash did at least confirm that the dramatically flared bow does a competent job of keeping the sea where it belongs. The new Navetta line makes a slightly incongruous stablemate for Filippetti Yachts’ high-performance Evo and Daemon marques. 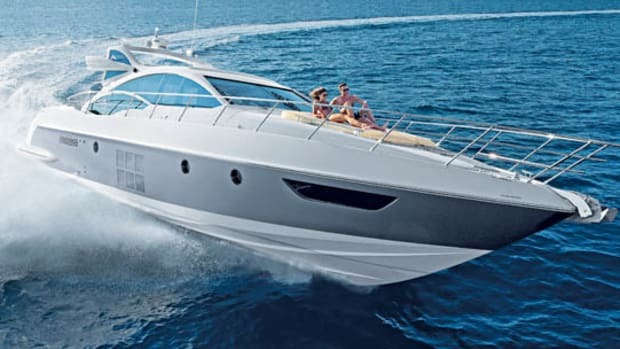 And it might seem a radical departure for a company chairman who is a self-confessed speed freak, with a proven record in high-performance motoryachts that few can match, in Italy or anywhere else. But he’s serious about it. This 26 made a very confident debut at the last Cannes show, and there are plans to augment the Navetta range with 30- and 33-meter models. If Fausto Filippetti is right—and he often is—we’ll be seeing a lot more of them. HIGHLIGHTS: CMC Marine fin stabilization; 2 x 220-lb. Posidonia HV anchors w/328 feet and 261 feet 14mm chain; 2/3.5 kW bow windlasses; 2/2 kW stern windlasses; electro-hydraulic gangway, bathing ladder and garage door; Furuno NavNet 3D radar-plotter-depth; Furuno monitors, autopilot, GPS, VHF; Samsung LED TVs; stereo, DVD, and decoder in all cabins; Dolby Surround Sound in saloon, master, VIP; 47-gph watermaker. 2,600 gal. fuel, 370 gal. water, 12 persons, 2,600 lb. gear.